These unique flowers are a very interesting addition to any arrangement. Gomphrena have globular blooms about the size of a quarter that grow in summer and early fall. They come in white, yellow, pink and purple and can be used in various ways for weddings. This is a picture of yellow gomphrena and callas in a bridesmaid’s bouquet that we recently designed. The gomphrena has a very interesting texture mixed with other flowers or alone. Here is an example of a gomphrena boutonniere. The pink blooms you see are smaller than the yellow ones in the bouquet above. 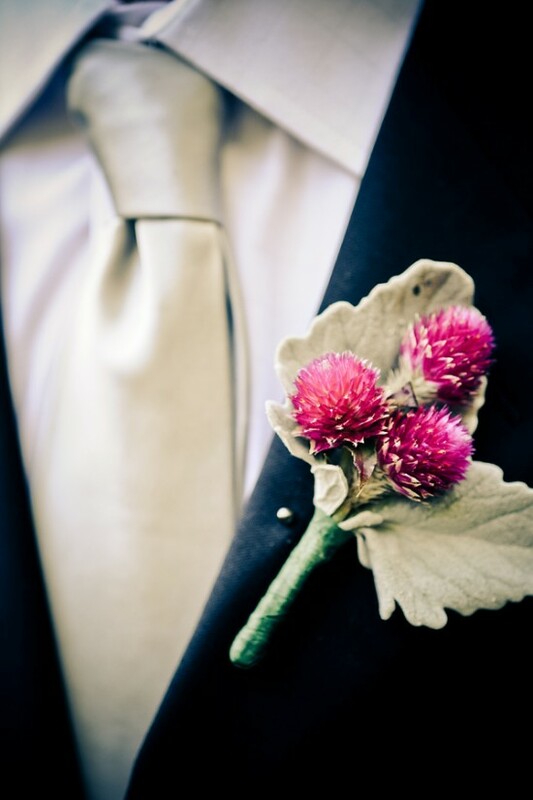 When the blooms are smaller, a few can be used in a boutonniere. If the blooms are larger, we recommend one bloom for the men. Just another suggestion for those who are looking for flowers that are a little out of the box!